Mike Munger is a retired police detective and paramilitary operative. He lives with his family outside Boston, MA. In the summer of 2001 he deployed for 13 months as a United Nations Police Officer in Kosovo. 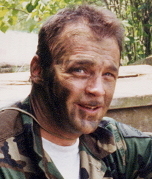 After September 11th, he served as a U.N. Special Operations Team leader. Mike is currently working as a private security contractor for a company based in South Carolina. He and Savant author Tom Donnelly were college roommates.